(Damian Dovarganes | AP file photo) In this Saturday, Dec. 15, 2018, file photo, United Teachers Los Angeles president, Alex Caputo-Pearl, left, joins teachers who may go on strike against the nation's second-largest school district, as they rally next to the Broad Museum downtown Los Angeles. 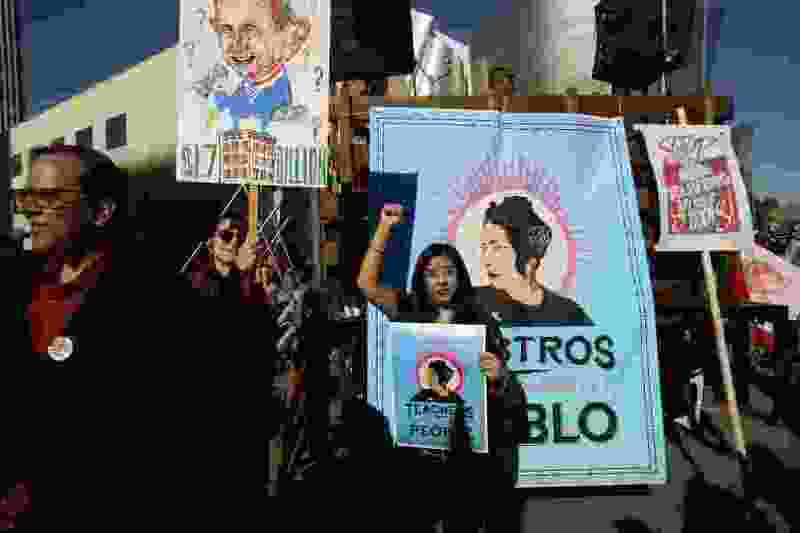 A massive teachers strike in Los Angeles is all but inevitable starting Monday, Jan. 14, 2019, after the two sides did not renew negotiations over the weekend. The teachers' union rejected a new offer Friday from the LA Unified School District after hours of talks. Los Angeles • A tentative deal was reached Tuesday between Los Angeles school officials and the teachers union that will allow educators to return to classrooms after a six-day strike against the nation’s second-largest district, officials said. "I'm proud to announce that, pending approval by the teachers represented by UTA and educational professionals and this Board of Education, we have an agreement that will allow our teachers to go back to work on the campuses tomorrow," Garcetti said. Union President Alex Caputo-Pearl said teachers would vote Tuesday, and he expected approval. The agreement was broadly described by officials at the news conference as including a 6 percent pay hike and a commitment to reduce class sizes over four years. Details were promised to be released later. Some teachers were already declaring victory despite a lack of details about the agreement. Thousands of boisterous striking teachers — many wearing red — and their supporters gathered on the steps outside City Hall. The crowd began roaring, blowing horns and chanting the initials of Caputo-Pear as the smiling leader emerged from the building and walked through the throng of teachers hoisting signs as a band rocked out on a stage nearby. "It's almost like metaphoric," Flores said. "The sun's out. When we started, it was all rainy and cold. I feel like it's a new day. It feels like we're on the brink of something new." Teacher Sharon Maloney said she was reluctant to support the deal without seeing the fine print. She was skeptical that the district had made enough concessions on class size, health care benefits for new teachers or that the superintendent would spend enough of about $2 billion in reserves. "I suspect the motives of Beutner," Maloney said. "If he doesn't release some of that $2 billion and there's no understanding for moving forward how he's going to cut out this crap that we're running at a deficit and yet our reserves are going up every year. That is false. I'm a math teacher. That is suspicious." Talks resumed Thursday at Garcetti's urging. The mayor does not have authority over LAUSD, but he sought to help both sides reach an agreement after nearly two years of fruitless talks that led to the walkout.